Brew Facts: The hops used in Head Hunter are simply Columbus, Simcoe, and Centennial, which goes to show it’s not the complexity of a beer’s hop profile, but how the brewer uses them. Head Hunter also won two silvers and a bronze in various competitions. Fat Head started as a craft beer tap house in 1992 and only started brewing their own beers in 2009, with a location in Pittsburgh, two in Ohio, and one soon to open in Portland, Oregon. Appearance: Crystal clear amber with a few bubbles wiggling to the surface. A fluffy white head cropped up and left clusters of large bubble islands. It settled to a thin white film. No haze, no proteins, just crystal clear amber, like carbonated, melted gold. Toast the sun and admire. Aroma: The aroma here is a real treat for lovers of tropical fruit IPAs. Pineapple, grapefruit and resiny goodness fill the nostrils. There is a citrusy/lemon and pine bite that gives a sharp end to the nose. Very fruit forward with some sweet, malty undertones. Inhale and think about the flavors waiting for you. Taste/Mouth Feel: This has a fizzy carbonation, but still very drinkable. The mouth feel has some body, but doesn’t get any where near syrupy (definitely the right choice here). For as fruit forward the aroma is, the taste reveals in bitterness. Initial taste is pineapple and pine, which mixes with a heavy hand of bitter. It leaves a deep, pine tar bitterness on the tongue and in the throat. Malt sweetness is toned down and only a background element, not a featured player. After a few sips, it settles into a cycle of submerging your taste buds in IBU rich hop, dipping down to a light malt sweet back bone and ramping back up to a rippy bitter finish. It is a touch floral/soapy but no more than a hint. It does have a few fruity elements of a West Coast IPA, but the heart is the bitter-forward, IBU-centric brews of the East Coast. Head Hunter also has an interesting trait that I haven’t come across before. Instead of hiding the ABV, it takes a modest 7.5% and somehow boosts it, making for a boozy warmth. 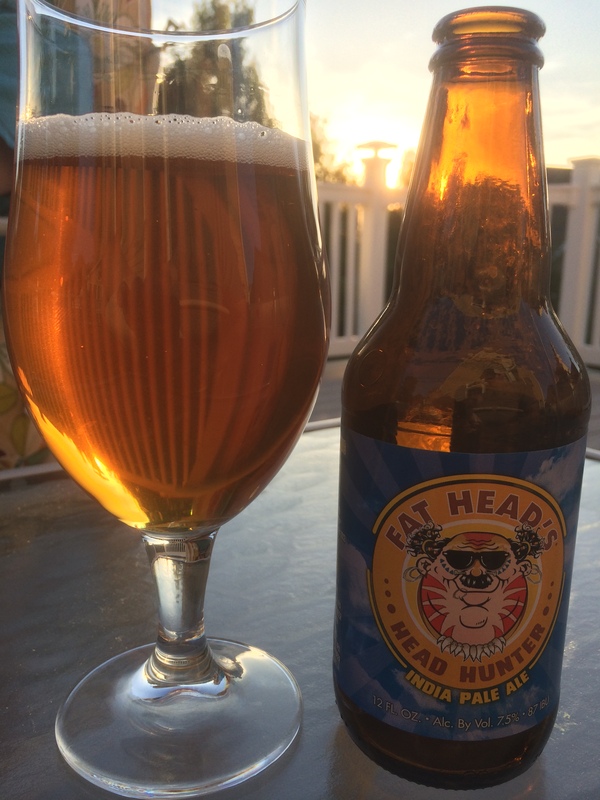 Final Thoughts: Head Hunter really surprised me, defying the expectations set by the aroma. This is like a battle between East and West Coast IPAs with the bitter, hoppy East winding up victorious. The fruity citrus and malt are wrapped up and dominated by a warm blanket of hoppy bitterness to make a metaphorical beer burrito. I normally like my IPAs to have a better fruit/malt presence with balanced bitterness, but I can’t fault the bitter-is-better crowd if this is one of their favs. For me, a solid IPA that I will have again any time, but at $6 a bottle, I won’t be going out of my way to add this to my regular drinking beers. Now possibly home brewing a clone…that’s a different matter.